Even though the chat room may show a lot of people, sometimes it will take a few minutes before anyone can read it. If you are waiting too long for a response, you can try again later or checkout the forum. Note that nobody on IRC is paid to answer your questions. This is not a company support channel but a place where developers and users of Krita discuss Krita’s development. You can ask questions, but you will have to be patient, and you might see other discussions going on at the same time. Krita’s IRC channel is not logged, and if you leave, we cannot answer you. The above chat room uses a technology called IRC(Internet Relay Chat) . IRC is used because it is a real-time communication tool. Much of it is open source, and it has a variety of ways to connect to it. You can use your own IRC client to connect to the Krita chat room if you want. You can see an example below if interested. This example is using a Firefox plug-in called Chatzilla. There are many more ways to connect to IRC if you don’t use Firefox. For this example, you can see that I am connecting to the freenode network. 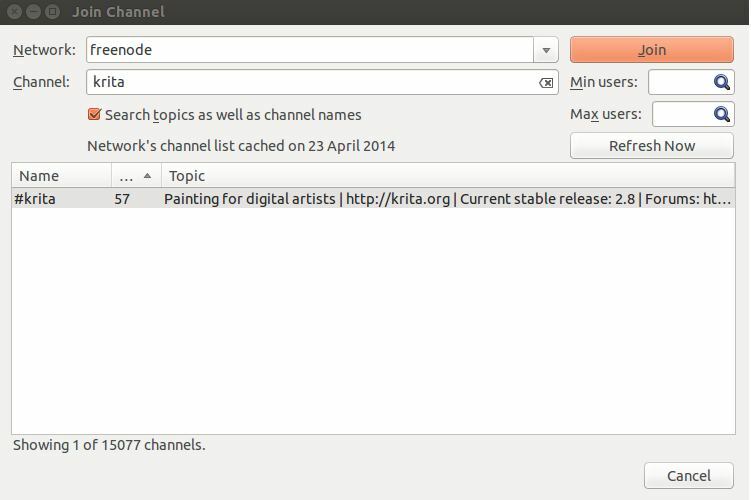 When you start typing “krita” in the channel area, the channel list will show the #krita room. If you select it and click the “Join” button in orange, you will enter the chat room.